Mondays are rough. They’re get out of bed early, put on a nice outfit, cram your feet into a pair of heels, and hustle yourself off to work days. I am super susceptible to the Sunday blues, the dread that looms over me from about noon on Sunday until I go to bed. The weekends are just so precious, and so brief. Sigh. Being thankful I have a job. Being thankful for the students whom I am proud of. Knowing that I have a great workout scheduled for the evening. Having a lunch of ravioli, sauteed zucchini, fresh tomatoes, and buffalo mozzarella packed up and ready to take to work with me. Having coffee scheduled to brew in the moments before my alarm goes off. Knowing that the next chapter of The Lovely Bones is awaiting me in my car CD player for the drive to work. Reminding myself, over and over again, that work is just what I do, not who I am. Yep. I’ve got a bad case of the Sunday blues right now. Funny thing is, though, I had already loaded the photos into this post prior to coming here to write tonight and, as soon as I pulled up this post with the photos, they made me feel better. These photos, with their brightness and their connotations of genuine goodness, made me smile, and made my stomach growl a bit, and made my mouth begin to water. These tacos make Sunday nights and Monday nights and Tuesday nights, and any other time you like, better. 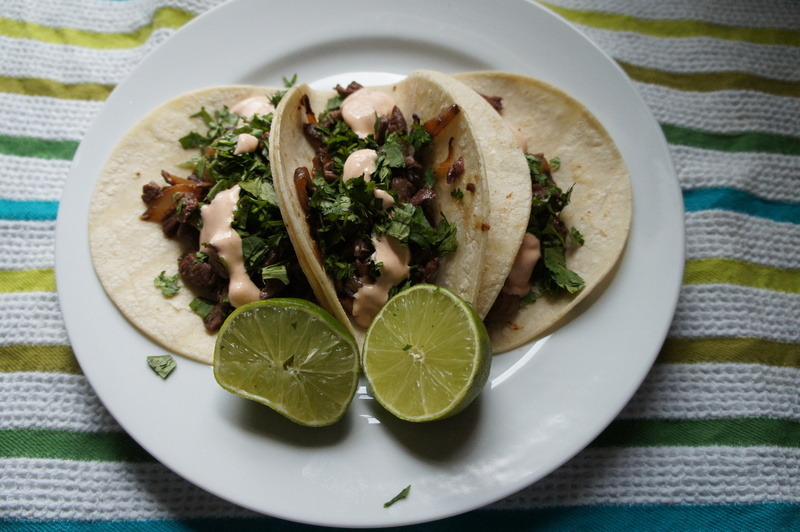 These are street tacos, which I’ve posted the recipe for before, but which I just couldn’t stand not sharing with you again. These street tacos are made from the second steak that Jason grilled for this meal. Here, the meat is chopped up and a yellow onion is sauteed until perfectly golden and sweet. Then, the steak is added to the pan with the onions and stirred around until heated through. 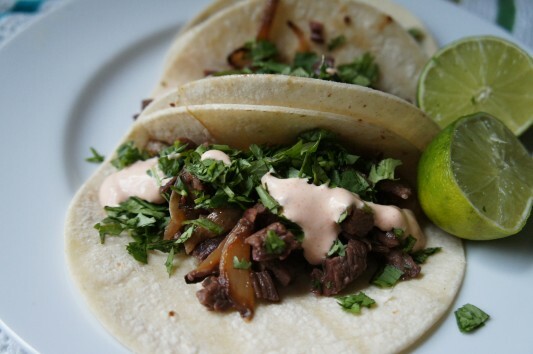 The meat and onion mixture is nestled inside of warm corn tortillas, then sprinkled with chopped cilantro. A lovely, spicy sauce is made of Greek yogurt, fresh-squeezed lime juice, and a drizzle of Mexican hot sauce, until the spice is to your liking. These tacos are easy, and they are delicious, which is all that can be asked of a Monday night meal. I hope that your Sunday night and your Monday morning, and your entire week is just as easy and as delicious. Oh do I EVER have a case of the Monday blues!!! Instead of getting ready, I’m reading your fabulous blog! Those tacos are always the best! I will make sure and make them this week. <3 you friend! Happy week! Hope you have a great week, Sarah! Love you, friend.